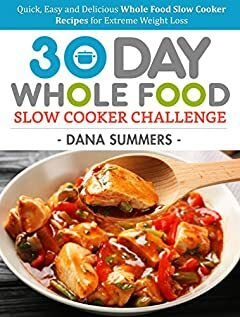 START YOUR 30 DAY CHALLENGE AND CREATE DELICIOUS WHOLE FOOD RECIPES MADE SPECIFICALLY FOR YOUR SLOW COOKER STARTING TODAY! When was the last time you had a real meal? Nothing packaged, canned, processed, or left to die in a freezer? And when was the last time you felt and looked your best? With this 30 Day Whole Food Slow Cooker Challenge, youâ€™re forced to take stock of your diet: only putting vegetables, fruits, nuts, meats, and fish into your bodyâ€”and tossing out the rest, including any potential allergens that may cause inflammation. Your body, mind, and waistline will thank you. And youâ€™ll wonder why you ever ate â€œfakeâ€ food in the first place. This book offers 47 step-by-step, slow cooker recipes, to help you save time, money, and calories. Each recipe offers serving sizes, calories, carbohydrate counts, fat counts, saturated fat counts, sodium counts, and protein counts to help you stick to your fitness and nutritional goals. The recipes offer incredible variety: from Asian-inspired to German and French cuisine, your kitchen has no bounds. And best of all? You can toss the ingredients into your slow cooker and literally forget about them for up to eight hours at a time.